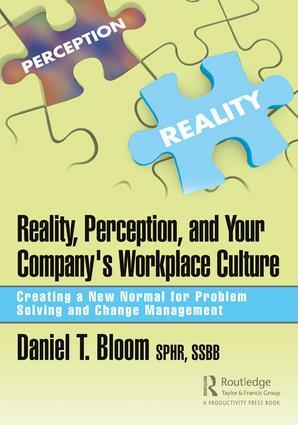 Reality and Perception and Your Company's Workplace Culture presents a demonstrable path for navigating the change-management process from beginning to end while fully detailing its obstacles and its triumphs. The book presents the view of a fictional 100-year old company called Acme Gyroscope, which is a family owned and run business, and the reader sees how the operation was ruled with an iron hand by the outgoing CEO. When the son of this current CEO assumes the role, he finds that the processes and culture within the organization are not quite as rosy as he thought they were. The new CEO finds that there is a wide divide between what is believed and what is real. The story follows the new CEO and his team as they uncover the problems that exist and discover solutions with the help of the Change Maestro who is an expert on understanding the difference between reality (see the problems, feel the problems, and create the new normal) and perception (preconceived notions of causes and solutions to problems). Utilizing the TLS (Theory of Constraints - Lean - Six Sigma) Continuum toolbox, the Change Maestro takes the management team through the process of resolving the issues at hand and assists in creating a new normal for corporate culture and problem solving. Presented in ten chapters, each representing points on the critical path, it walks the reader through the change process to its conclusion reaching the final point -- the argument for the new normal corporate culture for long-term strategy and survival.